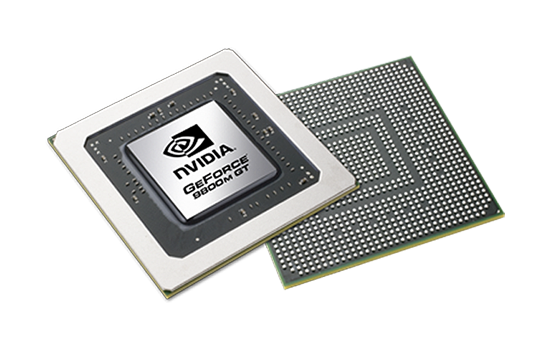 The Nvidia GeForce 9800M GT is based on the G92 architecture and is essentially a reduced 9800M GTX chip with only 96 shaders instead of the usual 112 found on GTX chips. Like with the 8800M GTX, the chip is produced in a 65nm fabrication process and even share comparable specs. Since this is an SLI system, the amount of available shaders is doubled due to the use of two 9800M GT cards. Note, however, that the available memory is not doubled because the same content is stored onto each card. Like all DirectX 10 graphic cards, the GeForce 9800M GT SLI contains "Unified Shader" cores, 2x96 stream processors to be exact. These cores take the place of dedicated pixel and vertex shaders and are even clocked higher than the core GPU itself. Hybrid Power is a Windows Vista only option that allows switching between onboard graphics (with Nvidia chipset) and dedicated graphics cards, in this case the 9800M GT SLI. Therefore, the dedicated graphics card can be disabled at will for power-saving purposes. Future Nvidia cards are expected to allow automatic switching through drivers, now known as Optimus Technology. GeforceBoost does not work with the 9800M GT because the connection with the SLI chipset would not result in any increase in performance. The performance increase of two 9800M GT cards in SLI mode is between 0% and 40% over a single 9800M GT, depending on the application. For current DirectX 10 games such as Crysis, World in Conflict, Bioshock or Age of Conan, the performance of dual 9800M GT cards should be sufficient for smooth play at high levels of detail. The phenomenon known as micro stuttering can occur in all SLI systems, including this 9800M GT SLI setup. The user may experience stutterings despite average frame rates of around 30fps. See here for more information on micro stuttering. A hardware feature of the GeForce 9000 series is the integrated PureVideo HD video decoder. This allows the GPU to aid the CPU in decoding H.264-, VC-1-, MPEG2- or WMV9 video files. The high current consumption of up to 130 Watt (when including both the VRAM and MXM board) means that the 9800M GT SLI is reserved for large and heavy laptops with sufficient cooling only. Therefore, the 9800M SLI series can only be found in big and heavy laptops.